Closed on Mondays – Run. Ride. Roam. The day dawned clear and blue and bright and gave every sign of being a cracker, weather wise. We hopped on the bus for the short ride into Lagos city to begin our day of exploring. 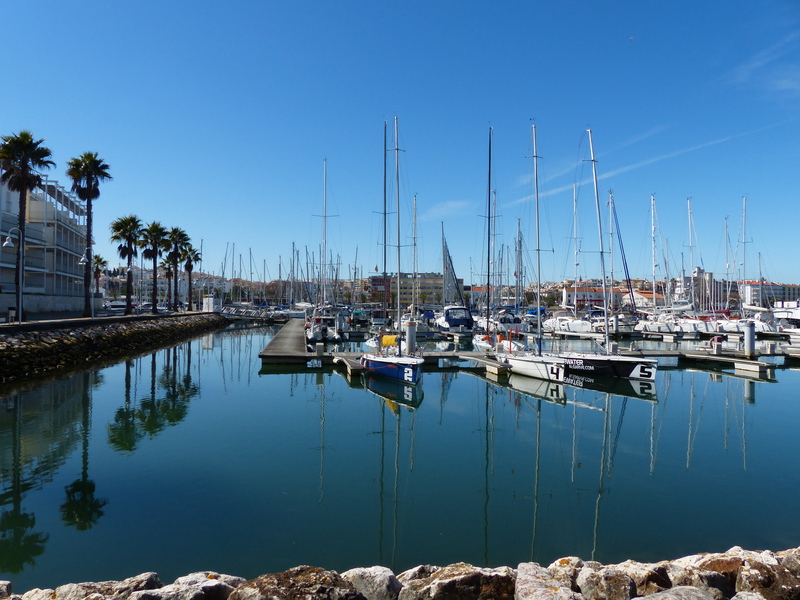 We strolled along the esplanade beside the marina and the sun beat down and even though it was only 9:30 in the morning, Steve said, “Boy, it’s warm,” and it was! The sun had some bite in it even at that time. 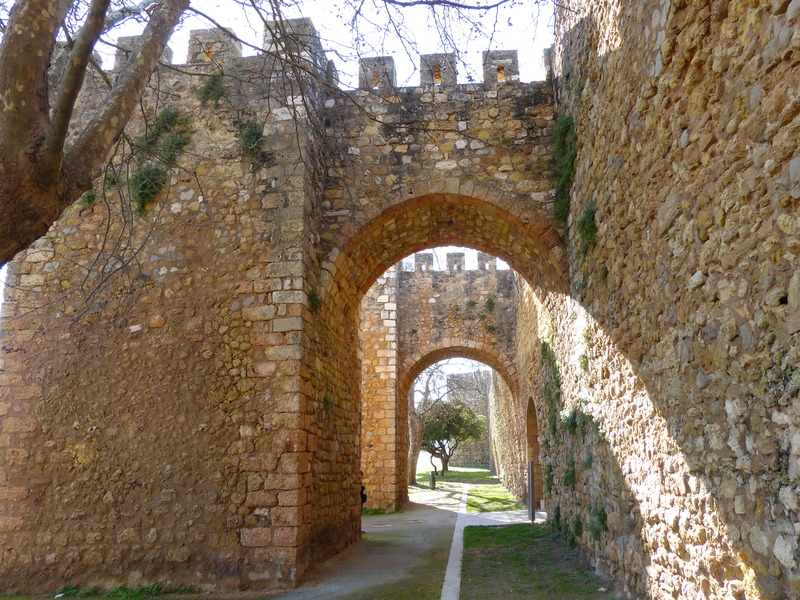 We strolled through the old town, with its fortress walls, monuments and churches. 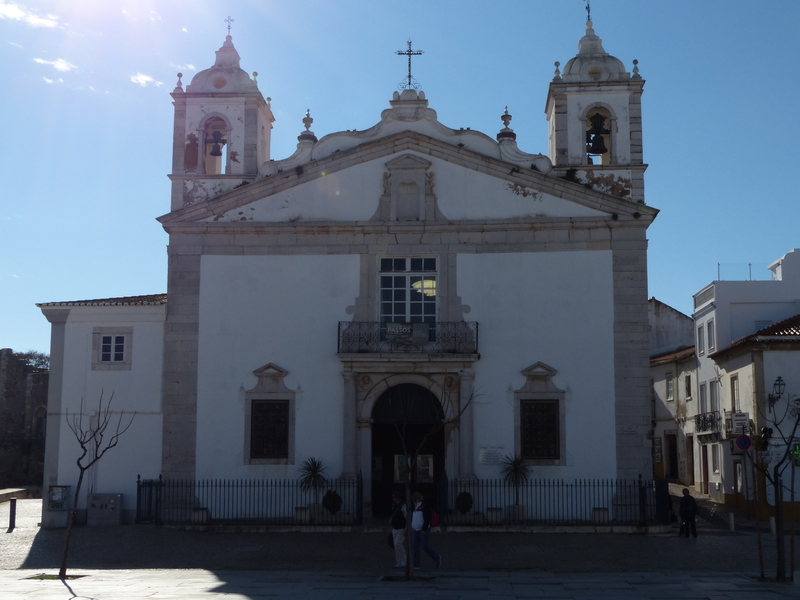 We walked up to the front of the historic and beautiful Church of Santa Maria. CLOSED ON MONDAYS said the sign. Oh well, it was nice to see from the outside anyway. We continued to roam and I’m still admiring the beautiful cobbled streets that we’ve seen. The detail and designs are just magic and shows the importance placed on aesthetics and beauty, even with the things we tread on. 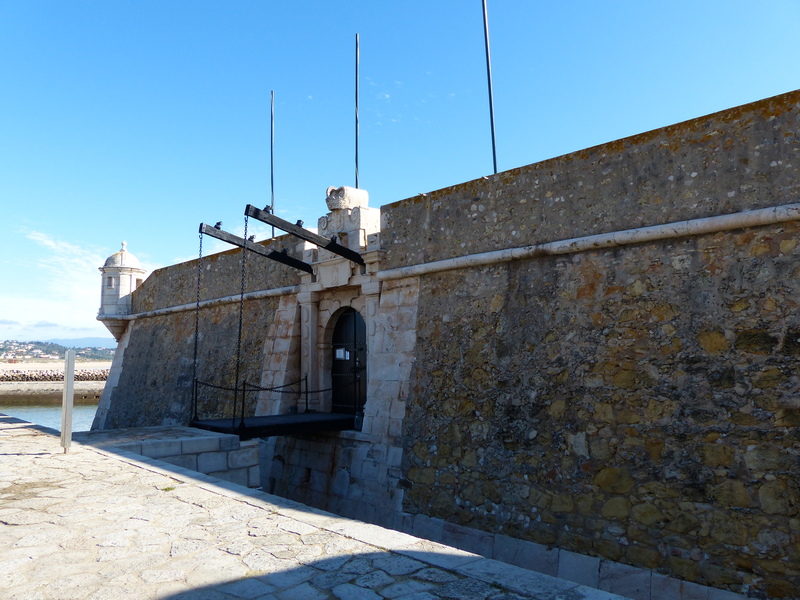 Further up the road we went to admire the Fort da Ponta da Bandeira, a 17th century battlement that was designed to protect and defend Lagos from boats entering the bay. CLOSED ON MONDAYS the sign proclaimed. Not to worry, we strolled around the perimeter and looked out over the water and it was lovely. Further back towards the square was a museum we’d wanted to visit – the historic Slave Market, describing the awful history of the Portuguese slave trade. The first slaves to be brought to Europe in post-medieval times came through this building and it dates back to 1444. We located it on the map and walked up to the iron fence surrounding the stone building. CLOSED DURING WINTER MONTHS. Hmmm, shame because I’d wanted to learn about that, but oh well, at least the sign was a variation on the theme so far. We walked into the square, where we sat beside the fountain for a spot of people watching. Steve wandered off to find a drink and investigate an electronics store, so I happily sat and took in my surroundings. As I sat, it struck me that I was at the centre of two distinct groups orbiting around me…Foreigners and Locals. I began to construct a mental list of criteria for identifying each particular specimen and with the tone of David Attenborough echoing in my head, I began my contribution to the Nature Channel. I’m sure there’s a series on the Discovery Channel just begging to be made. The locals, in contrast, were rugged up in multiple layers of black, brown and grey jumpers, jackets and coats, scarves and boots – it is winter after all. I assessed Steve and myself and we certainly looked the foreigners that we are, in our caps and sandals, with just a hint of the darker clothed local, given that we don’t own anything of a pastel shade. A smile and a shake of the head from us. Another smile, shake of the head, no thank you and wave of the hand from us. More smiles from us as we walk past. Now how about that. It was almost as if she was doing her job, having a go at making a sale and then finished it off with a comment to essentially say, please don’t take offence at me trying to make a sale. How polite! It was a fun exchange. We got to the bridge that would take us over the water to the marina precinct and as I walked with the other foot traffic, my confusion rose to the surface. 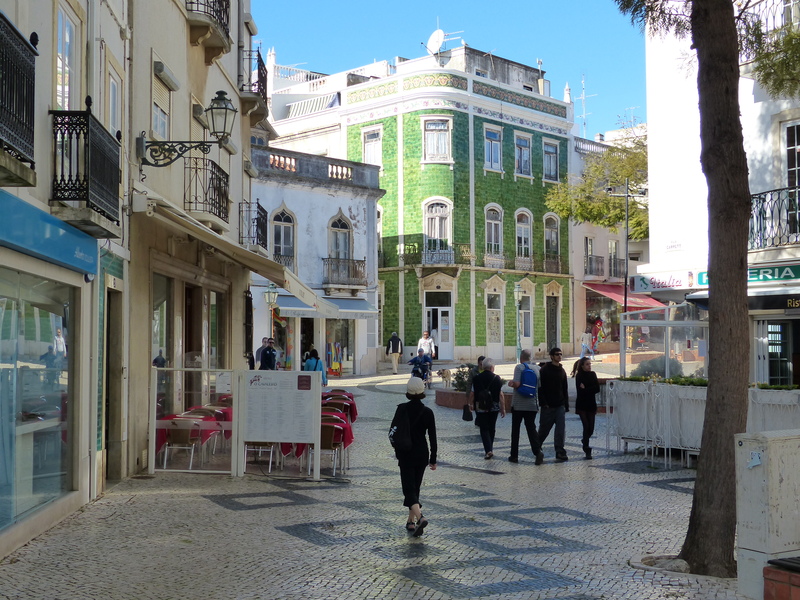 There is no system to which side of the footpath to walk, given that there is such a mix of Portuguese and visitors in the mix. Now, I know I’ve always been hopeless at this, and have never got it right. Each time we’ve visited the U.S. Steve and I walk along like a cross between a line dance troupe and a sheep dog trial, with me walking on the left-hand-side of the path, like I do at home, forgetting things happen on the opposite side and I should be walking on the right. So I always end up getting in someone’s way and Steve walks behind me, calling instructions like I’m Jip the Kelpie…”Git around back there…right, go right,,,to the right” and I boot-scoot a step here and there to avoid crashing into some poor person who knows the right side of the street to walk on. Well here, there is no system because everyone’s from a different place, so everyone is using their own home-town system and I’m getting in everyone’s way! Just when I think I’ve adapted and I’m confidently walking on the right hand side of the path, I’ll be faced with someone coming towards me and I have to do a swift scoot to the left to avoid a collision. I give up. I think wherever I am, whatever country I’m in, I’ll just be doomed to the boot-scootin’ technique and will never get it right! As we entered the marina precinct, we again walked the gauntlet of another row of little tour agency tents and this time, a very jolly woman tried to attract our business. Smile, shake of the head, no thank you, from us. Jolly laugh from the lady, “Why not on this beautiful day?” Ha ha ha…big jolly laugh. Smile and laugh from us. “Only 10 Euro,” more ha ha ha jolly laughing. Even the spruikers are entertaining and engaging and friendly! We sat at the marina and had elevenses and I even took off my jumper and bared my arms! Now, you know it has to be pretty warm for me to get around in short sleeves! So it was a very very warm day. It was just lovely. We passed many more British accents and many of them have dogs with them. I could also tell the difference between local dogs and visiting dogs because the local dogs we’ve met so far have been big and angry and snarly. The visiting dogs all seem to be Spaniels, Schnauzers and Yorkie Terriers with smiles and wagging tails. I guess they are on holiday so should be in a pretty peaceful state of mind. It must be a pretty dog friendly place though, with lots of pet-friendly hotels for there to be so many holidaying pooches about. 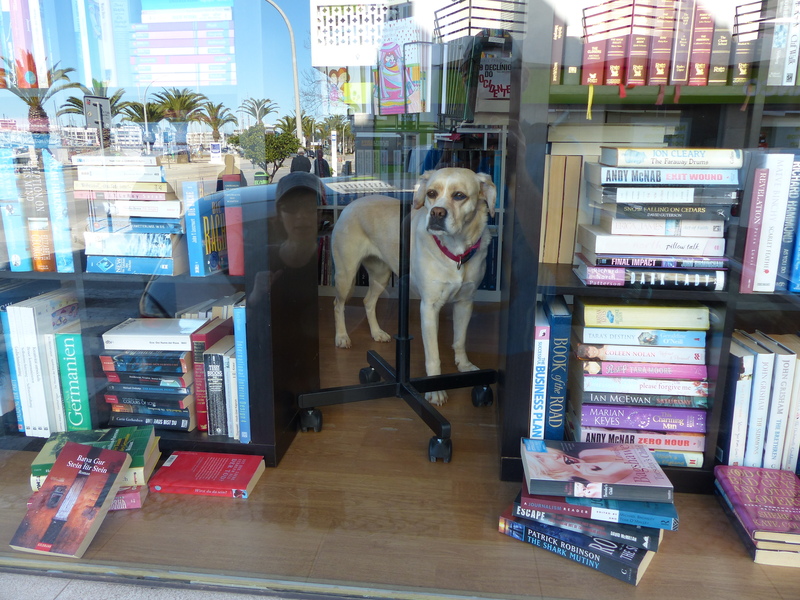 We even saw a dog browsing in a book store. My kind of place! Something else I’ve noticed since we’ve been in Portugal, is there are hardly any fast-food places around. 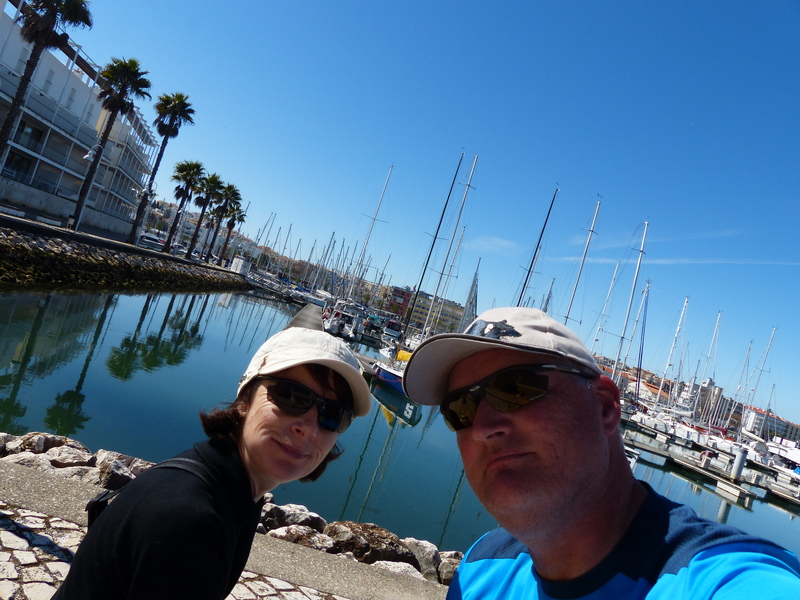 For all the walking and cycling around the capital city, Lisbon, I only saw two McDonalds and here, which is another fairly large city, I saw one sign for a McDonalds, but I haven’t seen any actual store and we saw one Pizza Hut at the marina. That’s been it. Maybe that’s why everyone looks such an average size, because the scourge of the western diet hasn’t yet managed to get a foothold. It’s quite refreshing to see! We finished off our roaming by locating a health food store for me, so I could stock up on some morsels for the traveller with high-maintenance dietary requirements and then sat by a fountain to eat some lunch before strolling back to the bus stop. So today was simply delightful. Roaming around the streets in the beautiful sunshine, taking in the sites and sounds of Lagos. It’s a lovely place…water, green hills, nice climate, friendly people…a top little spot! The Return of the Goat Track!